We offers premium wood cabinets that ensures you to get the finest products and the best customer service. 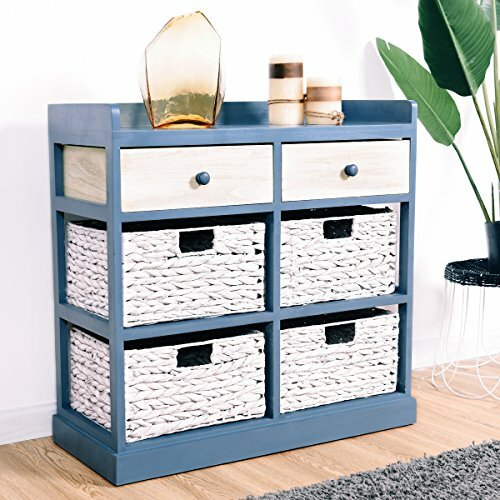 This Wood Drawer Cabinet will meet all the needs our customer are looking for: beautiful wood frame, super large storage room, sturdy & stable construction, healthy lacquer finish, easy to assemble, easy to clean and so on. This cabinet can not only be used as storage cabinet but also as side table! Look no further, it will be the best option for you! 【Wood Drawers & Water Hyacinth Drawers】The drawers are made of wood and water hyacinth to provide different layering, and also form a nice looking along with the wood body. The 12.6"x11"x4.4" wood drawers and 12.2"x10"x7" water hyacinth drawers provide super large storage room for plenty of items. 【Healthy & High Quality Material】This wood cabinet is made of premium candlenut wood without any industrial glue, and painted with eco-friendly healthy lacquer, zero formaldehyde release. So do the natural water hyacinth drawers, no harm to our body or environment at all. 【Sturdy & Stable Wood Construction】Constructed by premium candlenut wood frame in scientific angle that provides strong stability and durability. Every part of this storage cabinet is produced subtly with meticulous craft that ensures long-lasting lifespan. 【Ultra Smooth Lacquer Finish】The superior eco-friendly lacquer finish provides an ultra smooth touch for this storage cabinet, the soft touching gives you a comfortable enjoyment. And the edges of cabinet are all smoothed or rounded, so you don't need to worry about being hurt by the edges. 【Functional Top Storage Board】Especially designed with top storage board as an open storage area for maximum storage space. You can put your books, vases, snacks or any other stuffs on it, it provides you a convenient place to put your daily stuffs, definitely easy to reach.